Maple Cream Sandwich Cookies | Good. Food. Stories. I’m generally pretty good at resisting the holiday specialties that fill grocery store endcaps this time of year. All I need is one square of peppermint bark and I’m set for the season; a few splashes of eggnog in my coffee fulfill my quota for the year. But you know I have to have a weakness, otherwise this recipe story wouldn’t exist. And it’s no surprise that my Kryptonite comes in the form of a maple dessert. While I’m more than sick of the limited-edition Oreo flavors that continue to plague our shelves (I think cotton candy was the one that finally killed the love for me), I can’t believe they let the idea of a maple Oreo slide while other companies picked up their slack. I’ve seen house-brand boxes of maple cream sandwich cookies from supermarket house brands like Whole Foods and Fairway—and by seen, I mean purchased, sampled, and decided we needed a homemade version stat. After all, classic snacks are always better when they’re made from scratch. I would eat these maple cream sandwich cookies in summer without a second’s hesitation, but ’tis the season and all. 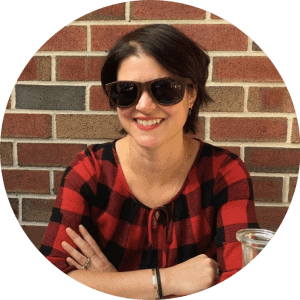 And the beauty of maple is that it matches so well with the other traditional tastes of the holidays—it’s a nimble dance partner for whatever you’re sipping to get your festive fix. Dunk a cookie in peppermint hot chocolate, a gingerbread latte, or a cup of eggnog. 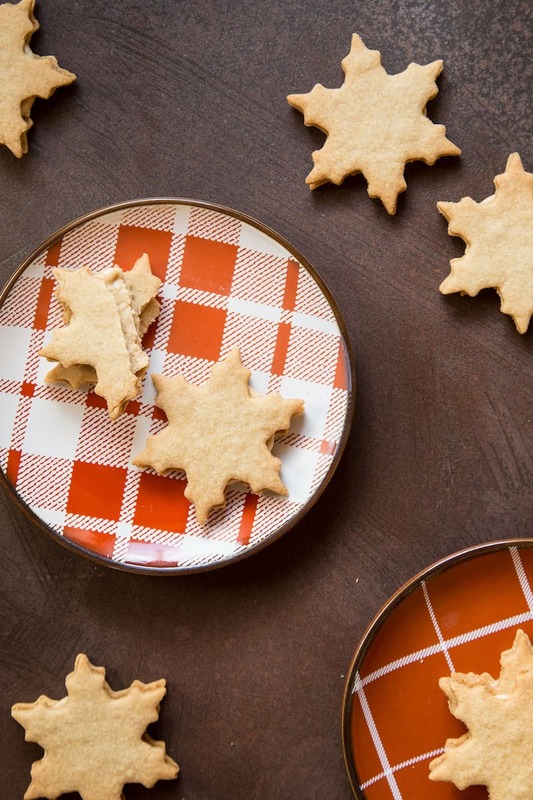 Pair any of those with a shot of booze and you’ve got a party, or go even further and serve a plate of these cookies with a few mugs of mulled wine or cider, or even a spiced winter sangria. 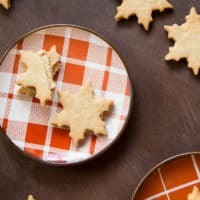 And because the maple-tinged dough is basically an amped-up version of sugar cookie dough, you can use whatever roundish shape you want for your cutouts. I chose delicately pointed snowflakes in place of the usual fluted rounds, but tiny snowmen or mini gingerbread men would make slightly larger (let’s call them deluxe) sandwich cookies. Or if you’ve got maple leaf cookie cutters, this is obviously the appropriate place to use them! I’m going to practice what I preach and eat one of these maple cream sandwich cookies with my morning coffee. I suggest you do the same. 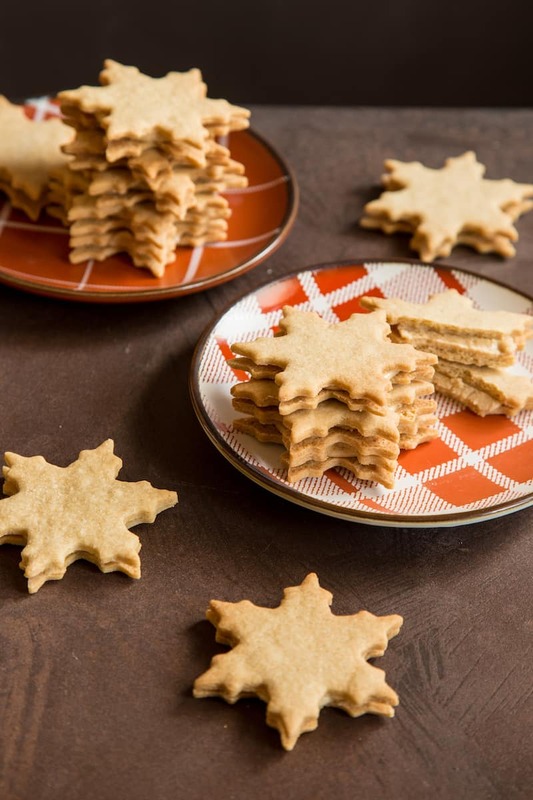 Maple cream sandwich cookies are festive for the holiday season and make a wonderful flavor alternative to traditional chocolate and peppermint treats. Whisk both flours, baking powder, and salt together in a medium bowl and set aside. Beat the butter, shortening, and sugar together with a stand mixer or an electric hand mixer at medium speed for 3-4 minutes until the butter is fluffy and pale. Reduce the mixer speed to low and stir in the egg and the maple extract. Add the flour 1/4 cup at a time to make a soft cookie dough. Divide the dough into 4 pieces and wrap each in plastic wrap. Refrigerate the dough overnight if you can—if you're in a hurry, chill for at least 2 hours until firm. Preheat the oven to 350 degrees F and line 2 baking sheets with parchment paper or silicone liners. Unwrap 1 of the dough pieces and roll out on a floured work surface until the dough is no more than 1/4 inch thick. 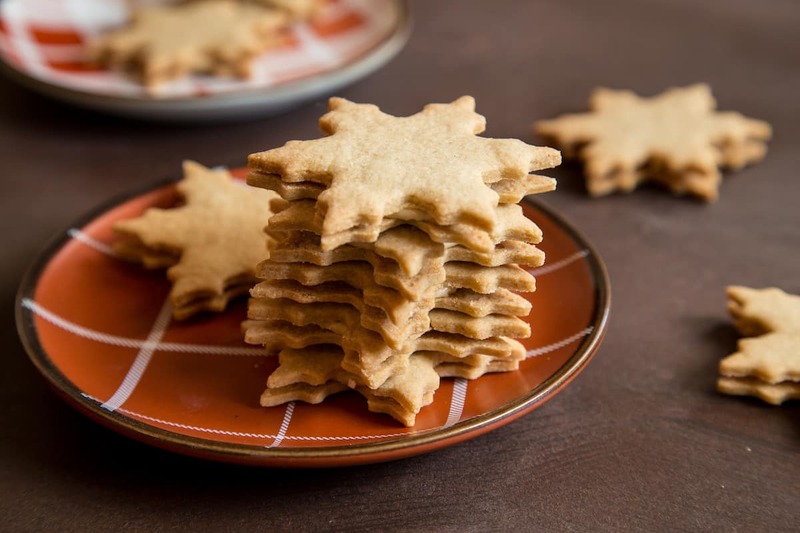 Use a cookie cutter about 1 1/2 to 2 inches in diameter to cut out as many cookies as you can, re-rolling the dough scraps just once if needed to get about 24 cookies. Your yield may vary slightly if you're using shaped cookie cutters (like I did with snowflakes) instead of plain or fluted rounds. Transfer the cookies to the baking sheet and repeat with the remaining dough. Bake for about 10 minutes, just until the cookies are no longer shiny on top but barely starting to color around the edges. Blend both sugars, corn syrup, shortening, maple extract, and milk with a stand mixer or an electric hand mixer on low speed until combined, about 30 seconds. Increase the speed to medium and beat to make a soft, frosting-like filling. Gently press another cookie on top of the filling to flatten.